March may be almost over but the Madness is not! We couldn’t help but post a “round two” of March Madness Link Friday. Check out some ways companies are participating this year. These brands are taking advantage of the low-budget social media opportunities for advertising during March Madness. And here are some restaurants that are getting creative this March. Capital One is incorporating Twitter into its advertising campaign, asking users to hashtag #rallycry and talk about their favorite teams. @USATODAYsports is asking users to send photos of their March Madness experience with the hashtag #FanMadness. Here’s why your brand should join the madness come next March. There’s less than two weeks left of the tournament, so enjoy! No matter what your level of sports expertise or interest in basketball, March Madness is famously the one sporting event everyone can enjoy. Here’s what’s happening in social media this March! Facebook is finally partaking in the Madness with a social application, Fanhood’s March Madness Brackets. Twitter’s “instant replay” concept will allow users to catch highlights from all of the tournament games within minutes of them happening. Are you one of those people who bases your bracket on favorite uniforms? Coolest mascot? Or another silly-but-entertaining measure? Well this bracket uses “Klout Scores,” ranking each of the teams by their social media influence. But most importantly, these apps (and these!) will help you win your March Madness pool. So tell us… who do you have winning it all? Wisconsin’s Best Bests readers said they wanted more information on events and fun things to do. We listened and we revamped the newsletter with design and content elements that make it a Best Bet. Maps are worthless unless they’re useful. 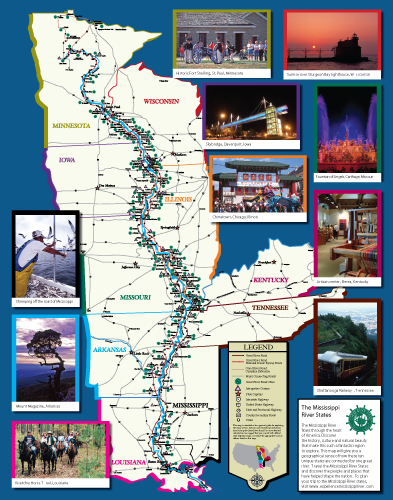 The Mississippi River Parkway Commission’s 10-state map is the only map you need for navigating the 3,000-mile National Scenic Byway along both sides of the Mississippi River. Looking to explore America’s greatest river? Grab this map and go. The final product is the result of working directly with 10 different state departments of transportation and dozens of other organizations. Large-scale projects with numerous stakeholders are just what Pilch & Barnet does best. There are thousands of travel apps out there. But which apps are worth your download? Every jet-setter should have these seven apps. Here are the best apps for airlines and hotels. Keep the kids entertained with these travel apps for kids. Foodies will appreciate these helpful travel apps. Finally, everyone can afford to have these free travel apps. Tell us… what’s your favorite travel app? Thanks to the internet, consumers are becoming increasingly more self-sufficient, relying less and less on the services of others. The declining use of travel agents is a perfect example of this. So why should you bother paying someone to do something you can do on your own for free? Here are 6 reasons to book with a travel agent. Expertise, experience and flexibility are among the reasons you should use a travel agent. Using a travel agent also can save you money. The more luxurious the trip, the more helpful it is to use a travel agent. This guide will help you decide when to book with an agent vs. booking online. Still reluctant? Check out these tips so you don’t get scammed by travel agencies. The No. 1 rule: if it sounds too good to be true, then it probably is. Only time will tell if the demand for travel agents will outlast the world’s shift to digital; but for now, we recommend exploring the option of booking an agent. Happy Friday! Today’s travelers have a wealth of resources available for trip planning. Aside from using recommendations from friends, travel websites and online reviews, you can now reference a number of social media sites specifically designed to connect travelers. Which social media travel sites should you be checking out? Budget Travel outlines the best social networks to use for travel. Trippy wants you to collect travel ideas and plan great trips. GogoBot connects with Facebook to help you see where friends are traveling. IgoUgo, a site overseen by Travelocity, brings together over half a million travelers to share tips and advice. Couchsurfing turns you into a real couchsurfer, helping you find free and cheap places to stay in people’s homes. Finally, Tripping connects travelers in 175 countries, finding places for you to stay. These sites allow you to connect with other knowledgeable travelers to get the best travel advice possible. Unlock the power of social and try one out today!